A class exercise at MIT, aided by industry researchers, has led to an innovative solution to one of the longstanding challenges facing the development of practical fusion power plants: how to get rid of excess heat that would cause structural damage to the plant. The new solution was made possible by an innovative approach to compact fusion reactors, using high-temperature superconducting magnets. This method formed the basis for a massive new research program launched this year at MIT and the creation of an independent startup company to develop the concept. 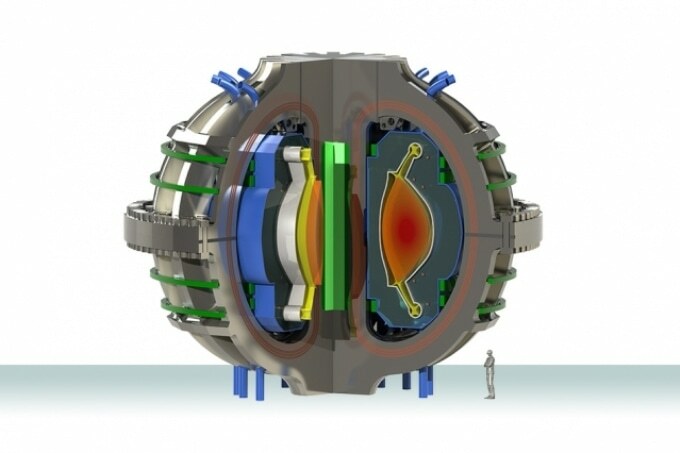 The new design, unlike that of typical fusion plants, would make it possible to open the device’s internal chamber and replace critical comonents; this capability is essential for the newly proposed heat-draining mechanism. The new approach is detailed in a paper in the journal Fusion Engineering and Design, authored by Adam Kuang, a graduate student from that class, along with 14 other MIT students, engineers from Mitsubishi Electric Research Laboratories and Commonwealth Fusion Systems, and Professor Dennis Whyte, director of MIT’s Plasma Science and Fusion Center, who taught the class. In essence, Whyte explains, the shedding of heat from inside a fusion plant can be compared to the exhaust system in a car. In the new design, the “exhaust pipe” is much longer and wider than is possible in any of today’s fusion designs, making it much more effective at shedding the unwanted heat. But the engineering needed to make that possible required a great deal of complex analysis and the evaluation of many dozens of possible design alternatives. Fusion harnesses the reaction that powers the sun itself, holding the promise of eventually producing clean, abundant electricity using a fuel derived from seawater — deuterium, a heavy form of hydrogen, and lithium — so the fuel supply is essentially limitless. But decades of research toward such power-producing plants have still not led to a device that produces as much power as it consumes, much less one that actually produces a net energy output. Earlier this year, however, MIT’s proposal for a new kind of fusion plant — along with several other innovative designs being explored by others — finally made the goal of practical fusion power seem within reach. But several design challenges remain to be solved, including an effective way of shedding the internal heat from the super-hot, electrically charged material, called plasma, confined inside the device. Most of the energy produced inside a fusion reactor is emitted in the form of neutrons, which heat a material surrounding the fusing plasma, called a blanket. In a power-producing plant, that heated blanket would in turn be used to drive a generating turbine. But about 20 percent of the energy is produced in the form of heat in the plasma itself, which somehow must be dissipated to prevent it from melting the materials that form the chamber. No material is strong enough to withstand the heat of the plasma inside a fusion device, which reaches temperatures of millions of degrees, so the plasma is held in place by powerful magnets that prevent it from ever coming into direct contact with the interior walls of the donut-shaped fusion chamber. In typical fusion designs, a separate set of magnets is used to create a sort of side chamber to drain off excess heat, but these so-called divertors are insufficient for the high heat in the new, compact plant. One of the desirable features of the ARC design is that it would produce power in a much smaller device than would be required from a conventional reactor of the same output. But that means more power confined in a smaller space, and thus more heat to get rid of. “If we didn’t do anything about the heat exhaust, the mechanism would tear itself apart,” says Kuang, who is the lead author of the paper, describing the challenge the team addressed — and ultimately solved. In conventional fusion reactor designs, the secondary magnetic coils that create the divertor lie outside the primary ones, because there is simply no way to put these coils inside the solid primary coils. That means the secondary coils need to be large and powerful, to make their fields penetrate the chamber, and as a result they are not very precise in how they control the plasma shape. But the new MIT-originated design, known as ARC (for advanced, robust, and compact) features magnets built in sections so they can be removed for service. This makes it possible to access the entire interior and place the secondary magnets inside the main coils instead of outside. With this new arrangement, “just by moving them closer [to the plasma] they can be significantly reduced in size,” says Kuang. In the one-semester graduate class 22.63 (Principles of Fusion Engineering), students were divided into teams to address different aspects of the heat rejection challenge. Each team began by doing a thorough literature search to see what concepts had already been tried, then they brainstormed to come up with multiple concepts and gradually eliminated those that didn’t pan out. Those that had promise were subjected to detailed calculations and simulations, based, in part, on data from decades of research on research fusion devices such as MIT’s Alcator C-Mod, which was retired two years ago. C-Mod scientist Brian LaBombard also shared insights on new kinds of divertors, and two engineers from Mitsubishi worked with the team as well. Several of the students continued working on the project after the class ended, ultimately leading to the solution described in this new paper. The simulations demonstrated the effectiveness of the new design they settled on. “It was really exciting, what we discovered,” Whyte says. The result is divertors that are longer and larger, and that keep the plasma more precisely controlled. As a result, they can handle the expected intense heat loads. “You want to make the ‘exhaust pipe’ as large as possible,” Whyte says, explaining that the placement of the secondary magnets inside the primary ones makes that possible. “It’s really a revolution for a power plant design,” he says. Not only do the high-temperature superconductors used in the ARC design’s magnets enable a compact, high-powered power plant, he says, “but they also provide a lot of options” for optimizing the design in different ways — including, it turns out, this new divertor design. Going forward, now that the basic concept has been developed, there is plenty of room for further development and optimization, including the exact shape and placement of these secondary magnets, the team says. The researchers are working on further developing the details of the design. “This is opening up new paths in thinking about divertors and heat management in a fusion device,” Whyte says. The team included MIT students Norman Cao, Alexander Creely, Cody Dennett, Jake Hecla, Adam Kuang, Alex Tinguely, Elizabeth Tolman, Hannah Hoffman, Maximillian Major, Juan Ruiz Ruiz, and Brandon Sorbom, PSFC Research Scientists Daniel Brunner and Brian LaBombard, Professor Dennis Whyte, and Mitsubishi Electric Research Laboratories engineers Piyush Grover and Christopher Laughman. The work was supported by MIT’s Department of Nuclear Science and Engineering, the Department of Energy, the National Science Foundation, and Mitsubishi Electric Research Laboratories.